Would you like to try your hand at making cider? This all-in-one cider making kit is a good way to get started. Mangrove Jack’s British Series Apple Cider Pouch is a convenient all-in-one kit for making cider at home. It has the taste of delicious orchard apples; light and crisp with a juicy apple bite. Only the freshest and best quality fruit are used in this cider. It is pressed and concentrated using state of the art evaporators, and then cold filled into a pouch. This ensures the natural flavor of the fruit is preserved, giving you cider which is fresh and crisp. These kits come with yeast, preservative, sweetener, and Cider Extract. The yeast, preservative, and sweetener can be found in a pouch inside the W300 bag. Please Note: You will need 2-2.5 lbs of dextrose (corn sugar) for this kit as well (the directions call for 1 kg, or 2.2 lb). See our You Might Also Need Section below for products. These kits are tasty uncarbonated, but add some bubbles and things get even better. 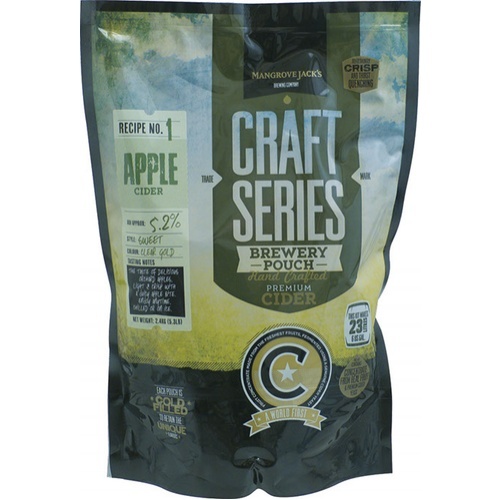 We recommend a pack of Carbonation Drops to help give this cider a carbonic kick! Fermentation Bucket - 7.9 gal. Easy to make, good results in the past. My wife loves ciders and since Iâ€™m new to homebrew I thought Iâ€™d make something we can both enjoy. I was looking for a cider kit as my wife and I like ciders. I will ferment this and add cherry concentrate to serve at my granddaughters graduation this summer. Easy to use. Ferments into a decent cider. Maybe a little too much apple essence. I get that it's just a basic cider kit, but I was pretty disappointed in the overall flavor. Lacked any kind of character. I have used this once before and made a Cherry Cyser turned out beautiful. Easy to make your cider, good instructions. The work to make it is super easy and simple. It's cider concentrate, and you just add water and yeast. The outcome is a decent cider. The only downside is that drinking it gives us heartburn. This kit was very simple to make. The whole process took about 10 minutes, including sanitizing my fermentation bucket. I made a 250ml starter using a stir plate 2 days prior (DME & Fermaid K). I used cold, filtered water to hit the target volume and followed all directions (except for any heating that may have been specified).. basically followed a no boil mead or wine protocol. There's an artificial apple flavor packet that's part of this kit that seems a bit dodgy, but I used it as indicated despite my reservations. The cider fermented on the low-mid range specified for the included yeast strain for a month, then another month in secondary better bottle. The finished product was good, but not great: it tastes good, but it seems painfully under carbonated compared to Samuel Smith's Cider or Indigeny (local to CA). The instructions call for something like 5 oz priming sugar, probably because most people don't regularly use heavy belgian or champaigne bottles, so that's about 2.5 volumes CO2. I will certainly make this kit again, but I will use something on the order of 9oz sugar to hit 4.5-5 volumes CO2 and use heavy bottles. I might experiment with different yeasts in the future, or perhaps various pureed fruits, and expect this kit will provide a good foundation for many future batches. This eventually carb'd after 3 months conditioning in low 70F range. I would suggest a fresh re-pitch of yeast and conditioning at 2 weeks in the high range for the yeast if going to bottle. 1 year later, bottle aged, this cider is fantastic. Five stars, would not change a thing. Highly recommend. Nice, crisp & clear - more solid sediment in bottle. First 2 batches done. Did not add the sweetener and the result was a dry, crisp cider. Everyone who has tried it likes it better than the sweet store bought stuff. Used one carb tab for 1/2 liter bottle (about 16 oz) and got mild to low fizz. Sediment in bottle was easy to rinse out but firm enough that you don't have to be hyper careful doing a "one pour". 4 stars because my two batches came out at different ABVs - don't know why. More consistency (or a cute barmaid included) would get it a five. Will buy again. Good cider from concentrate? I was skeptical but it worked! I have been brewing beer for years and have wanted to get into cider but just never got to the point of finding 5 gallons of unpasteurized apple juice to work with. I saw this kit and it intrigued me but I wondered how good it could be. So I ordered it. First off let me say that the yeast, flavoring packet and sweetener are inside the wall of the pouch. I could find nowhere that said this so at first I thought the stuff was missing. Nope, it is there. I followed the instructions as far as the fermentation and adding the flavoring. The fermentation smelled something awful! Lots of sulfur smells - that made me wonder but I think it is normal for fermentation with fruit. After fermentation was done I read up on the sweetener packet and found it contained aspartame. I didn't want to add aspartame to my cider because to me it gives a distinct off flavor. At that point instead I took part of the cider (3.5 gallons) added 2 campden tablets, let it sit a couple of days and then added a 12 oz can of frozen concentrated apple juice and then kegged and force carbonated it. The other 2.5 gallons I bottled with carb tablets. Both turned out really good. The kegged cider is pretty sweet - definitely tastes like a lot of the bottled hard cider people like. The bottled cider is a little drier but still has some sweetness. So I sort of made 2 ciders from 1. I would definitely make this again with the tweaks I made. I mixed this kit up about six weeks ago. I'm waiting for the bottles to condition, I primed them to make a sparkling cider. Just because I was not familiar with Mangrove Jack at the time, I used White Labs WLP775. There is a little sachet of a white powder that the instructions say to add if you want your cider to finish sweeter, or to leave out if you want it to be dry. I put a little less than half of the pouch. There is another little pouch that is marked as apple flavoring. I don't know why you have to add that separately, shouldn't that be in the nature of the concentrated juice? Tasting a sample at bottling, the flavor was rather good. Finished crystal clear. Not giving this a full 5 stars just because of the mystery pouches, as well as there being no mention of what variety of apples this comes from. It would just be nice to know. Overall, very easy to make, taste pretty good, and I will make this one again. In hindsight I would have added more yeast at bottling. Maybe a Prise de Mousse. Having some big lag time in getting it to carbonate in the bottle. Can somebody make a 2gallon, 1.070+ beer with pale/munich/C40 malt, 0-45IBU, with WLP090 or WLP530 yeast and then add this kit at with last 10%-20% fermentation. if not dry enough then finish with champagne yeast, probably add Fermaid-O and/or DAP for yeast health and then report your results? ?